Brand: Autumn Carpenter Designs 35-1002 Units: 1 set / 7 pcs. total Wow! What a cool tool. Center your cakes and get garland/swags that are perfectly even. Set includes square flat marker which is used to center cakes and mark included swag impression markers evenly. It marks 16", 15,14", 13, 12", 11, 10", 9" 8", 7" and 6" cakes. Can also be used to mark swags which are odd sizes and aids in centering odd size cakes. It works on both rolled fondant cakes (mark as soon as cake is covered) and buttercream cakes (wait until icing crusts to mark). The garland markers allow you to create identical swags of various designs: Diamond shape, centered dot, dots, one line swag, two line swag and cornelli. Wow! What a cool tool. Center your cakes and get garland/swags that are perfectly even. Set includes square flat marker which is used to center cakes and mark included swag impression markers evenly. It marks 16", 15,14", 13, 12", 11, 10", 9" 8", 7" and 6" cakes. Can also be used to mark swags which are odd sizes and aids in centering odd size cakes. It works on both rolled fondant cakes (mark as soon as cake is covered) and buttercream cakes (wait until icing crusts to mark). 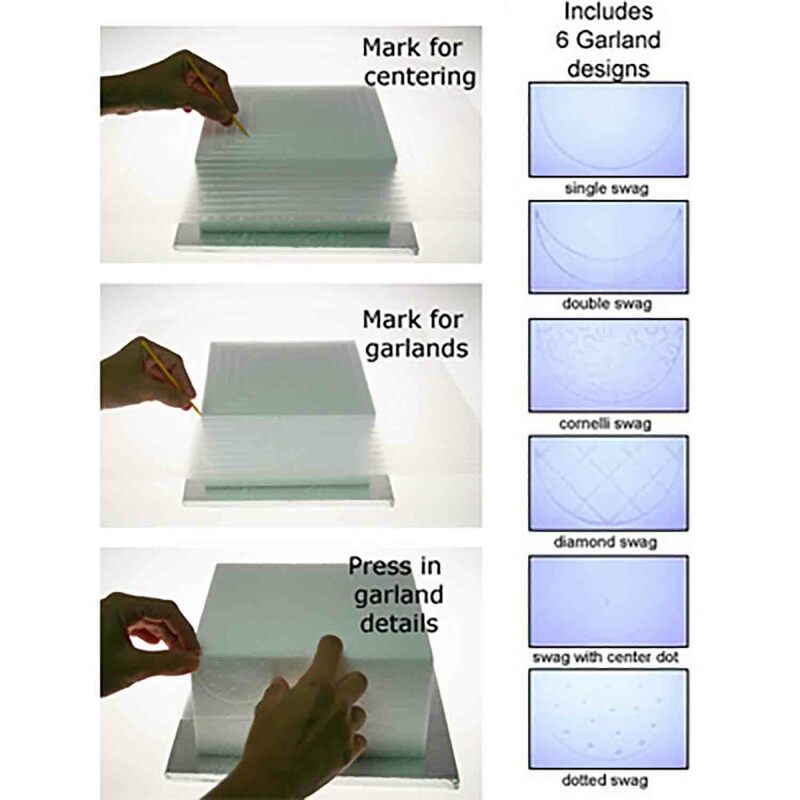 The garland markers allow you to create identical swags of various designs: Diamond shape, centered dot, dots, one line swag, two line swag and cornelli.